Nothing can beat the combo of steamed rice with hot Rasam. A heavenly combination, which is yet another healthy vegetarian recipes. Rasam is a South Indian spicy soup traditionally prepared using tamarind as a base along with tomato, chili pepper and other spices like cumin, pepper powder etc. Rasam is served along with steamed rice as a spicy soup which is fluid in consistency. Some of the most common recipes for Rasam are Tomato Rasam / thakkali rasam, Inji rasam, Garlic rasam, Parupu rasam, Mysore rasam, Jeera rasam and like so. 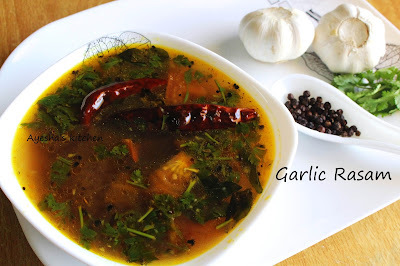 Garlic rasam is a spicy vegetable soup recipe loaded with flavors of garlic and other spices. 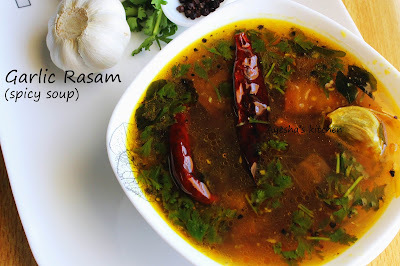 It is believed that this rasam recipe (garlic rasam) is very good for common cold, sore throat and fever. Garlic is considered to be the natural antibiotic and blood cleanser. The use of black pepper in this rasam also gives medicinal benefits apart from its taste and flavor. Indian food recipes include a wide varieties of vegetarian dishes. Vegetarian meals are an integral part of Indian recipes and this spicy soup recipes (Rasam recipe) plays an important role. Kerala cuisine (kerala recipes) is incomplete without rasam. It is a part and parcel of Kerala Sadhya recipes (Onam , Vishu like so). Lets move on to the recipe for rasam. Here is the recipe showing how to make Garlic rasam. Soak the tamarind in 2 cups of water and extract the pulp. Set aside in a non stick pan. Now coarse grind all the ingredients listed under coarse grind and combine it well with the tamarind water. Add a cup of water if required. Allow it to boil for 5 minutes and make the flame very low( or can off the flame). Meanwhile roughly crush garlic with skin for tempering and set aside. Heat a pan with oil and saute the ingredients given under to temper for few minutes until the raw smell disappears. Now add this tempered items to the tamarind mixture along with required salt and let it cook for 2 minutes in a low flame. When it starts boiling, garnish with coriander leaves and remove from fire. Serve hot with steamed rice..